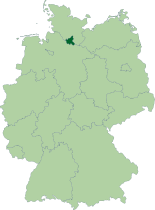 Hamburgh or in fou Free an Hanseatic Ceety o Hamburgh (German: Freie und Hansestadt Hamburg), is a ceety in the north o Germany on the baunks o the River Elbe, 180 km awa frae the German Ocean. Hamburgh aboot 1.73 million indwallers it is the muckle maist German ceety efter Berlin an the saxt lairgest ceety o the European Union. Wikimedia Commons haes media relatit tae Hamburg. This page wis last eeditit on 25 September 2018, at 15:40.